Gathering on the steps for Palm Sunday, we marked the beginning of holy week. 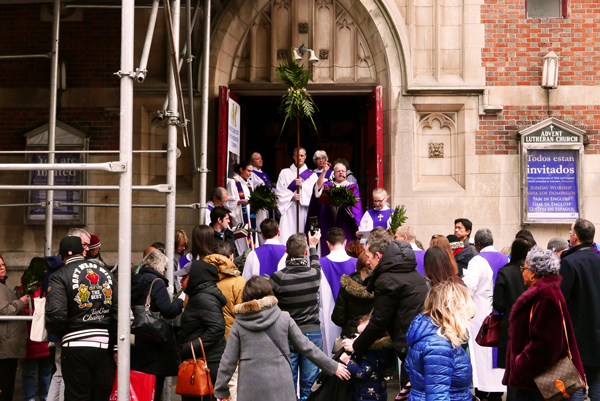 We started worship outside on Broadway, waving our palms as we processed into the sanctuary. We remembered how the people of Jerusalem waved palms as Jesus entered the city in a most unexpected way: riding a donkey. After worship, we asked a few people: What do the palms symbolize to you? "A path to walk on," Gerald said. "Welcoming Jesus into our lives," Ellie said. "Welcome, community, a party," Bayardo said. This week, we'll follow Jesus down the path that begins with waving palms and ends at the cross . . . or so people thought. We are his disciples receiving the First Communion in a small attic. We are in the garden, overhearing Jesus' fear and humanity as he faces death. We are in the crowd now roaring, "Crucify him!" We are with Jesus on the cross. We are visiting the tomb. And finally, we witness the Good News. Through this journey, in Christ, we find resurrection, new life, and hope. It didn't go anywhere, but sometimes we have to find it again. Join us on the journey this week. On Maundy Thursday, we share Holy Communion as disciples gathered around the table, remembering those who did it first. Our worship will also focus on forgiveness and prayer. On Good Friday, we have three unique worship times. The 12pm service is geared for kids but welcome to all. At 3pm, we have the Stations of the Cross in Spanish. 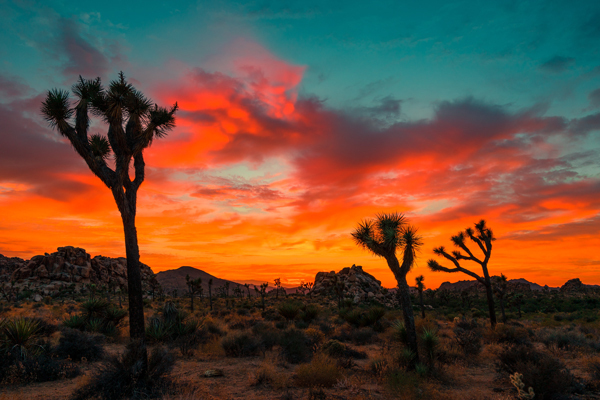 At 7:30pm, we journey through Jesus’ last hours with special readings and music by the Advent Chorale accompanied by a chamber orchestra. At our Easter Vigil worship, we light the traditional Pascal Candle outside and carry it into the church. Then we light our individual candles from it. In anticipation, we hear readings from the Old Testament for telling the coming the Christ and the resurrection. Easter Sunday at Advent is a joyous day! 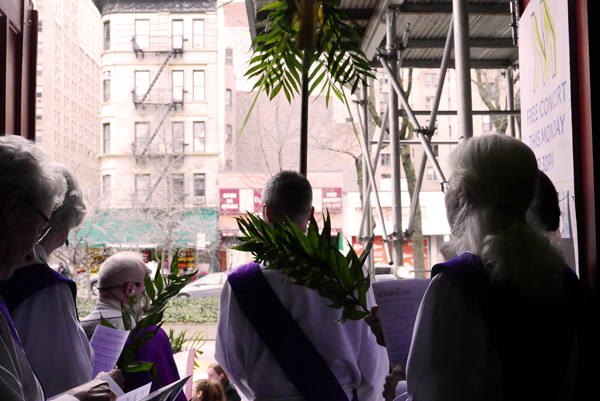 The Advent Chorale, Easter Lilies, trumpet, and Easter Breakfast downstairs from 10am-12:30pm make this a special day of celebrating love and community in Christ. Come join us! "I love my parish, but I have always had a vexed relationship with the church." The church, as an institution, is a work a progress. Margaret Renkl shares why Easter is still calling her back to church in this op-ed for the New York Times. If you want to re-watch, catch up on, share, or just check out the Carbon Fast daily devotion videos and e-letters we shared throughout Lent, we've put them all together on our website. 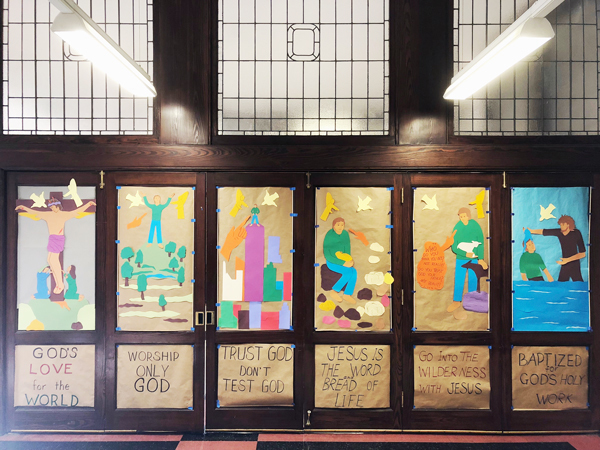 We want to lift up the amazing images Ellie Sudbrock and Lin Feucht created from paper cutouts to tell the story of Jesus' 40 days in the desert during Lent. What a gift it was to have these in our community hall downstairs throughout Lent.